One of the first plants to start blooming along Sunrise Highway in spring is Ceanothus, sometimes known as Wild Lilac or Mountain Lilac. We have both blue and white flowering shrubs on the mountain. The billows of white and blue you see driving up Sunrise Highway in April and May are Ceanothus. The various species of Ceanothus interbreed, so sometimes it’s difficult to know which species is which. Our mountains have Ceanothus leucodermis (blue flowering) and Ceanothus palmeri (white flowering) as well as others. On the coast, Ceanothus shrubs begin blooming in February. In the foothills, they begin to bloom in March. Driving up Sunrise Highway you can see spring moving up the mountain, with blooms at the base of Sunrise in April and on the top of the mountain well into June. In full bloom, the plant smells intensely sweet and is a magnet for bees. Ceanothus seeds are germinated by fire. The plants are also considered fire resistant, and they fix nitrogen into the soil as well as holding the soil of hillsides with their powerful root system. 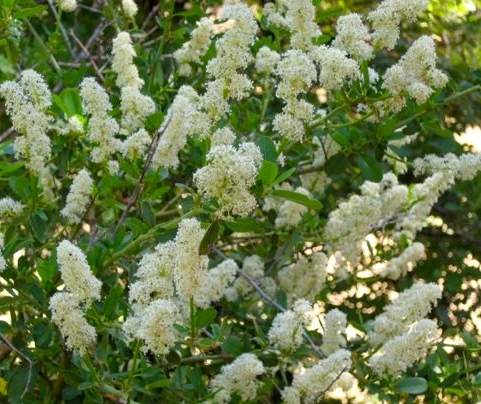 California Indians used Ceanothus blossoms and berries as soap and shampoo. If you rub the blossoms between your wet hands, they will lather as a result of the high saponins in the plant. Indians also used the plant as a blood purifier and general tonic. (Garcia & Adams, Healing with Medicinal Plants of the West, 2005). Ceanothus is known to herbalists as “Red Root” from the red color of the inner root bark. Modern day herbalists also use Ceanothus as a blood purifier. Red root is considered to be an herb that helps the liver purify the blood more effectively. It is also used to cleanse the lymph system. Thin lateral roots are gathered from plants that are at least two years old, never taking enough to harm the plant. The roots are chopped and placed in alcohol to make a strong extract. Red root is considered to be a very strong herbal medicine. This lovely plant packs a powerful wallop, so be sure to consult a professional before you use it.